The activity patterns of many sports (e.g. badminton, basketball, soccer and squash) are intermittent in nature, consisting of repeated bouts of brief (≤-second) maximal/near-maximal work interspersed with relatively short (≤60-second) moderate/low-intensity recovery periods. Although this is a general description of the complex activity patterns experienced in such events, it currently provides the best means of directly assessing the physiological response to this type of exercise. During a single short (5- to 6-second) sprint, adenosine triphosphate (ATP) is resynthesised predominantly from anaerobic sources (phosphocreatine [PCr] degradation and glycolysis), with a small (<10%) contribution from aerobic metabolism. During recovery, oxygen uptake (V̇O2) remains elevated to restore homeostasis via processes such as the replenishment of tissue oxygen stores, the resynthesis of PCr, the metabolism of lactate, and the removal of accumulated intracellular inorganic phosphate (Pi). If recovery periods are relatively short, V̇O2 remains elevated prior to subsequent sprints and the aerobic contribution to ATP resynthesis increases. However, if the duration of the recovery periods is insufficient to restore the metabolic environment to resting conditions, performance during successive work bouts may be compromised. Although the precise mechanisms of fatigue during multiple sprint work are difficult to elucidate, evidence points to a lack of available PCr and an accumulation of intracellular Pi as the most likely causes. Moreover, the fact that both PCr resynthesis and the removal of accumulated intracellular Pi are oxygen-dependent processes has led several authors to propose a link between aerobic fitness and fatigue during multiple sprint work. However, whilst the theoretical basis for such a relationship is compelling, corroborative research is far from substantive. 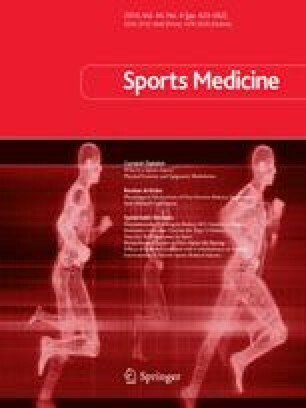 Despite years of investigation, limitations in analytical techniques combined with methodological differences between studies have left many issues regarding the physiological response to multiple sprint work unresolved. As such, multiple sprint work provides a rich area for future applied sports science research. The author would like to thank the following for their help in writing this review: the University of Edinburgh, St Mary’s College, Michael Hughes, Gill McInnes, Gavin Moir, Andrew M. Stewart, and Michael H. Stone. No sources of funding were used to assist in the preparation of this review. The author has no conflicts of interest that are directly relevant to the content of this review.